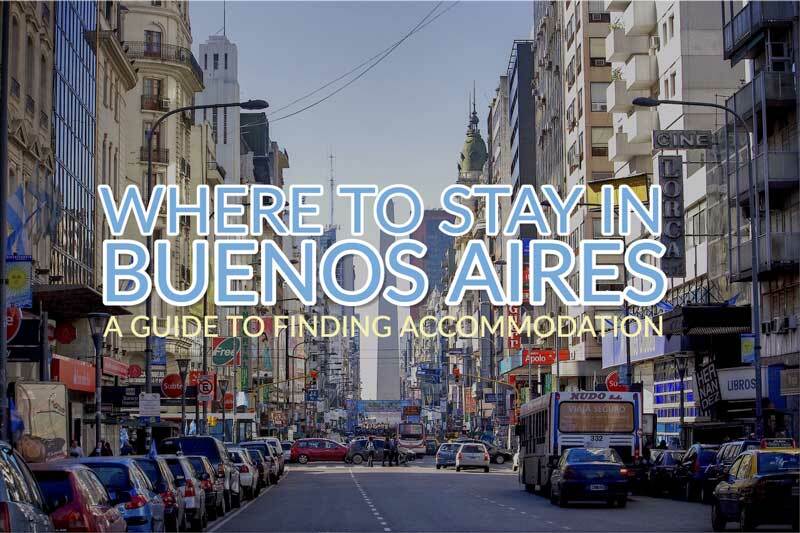 Finding somewhere to stay in Buenos Aires is not difficult in the short-term. Finding longer term rentals, on the other hand, takes some work. There are bargains in both types of accommodation and it pays to take some time to evaluate your options. 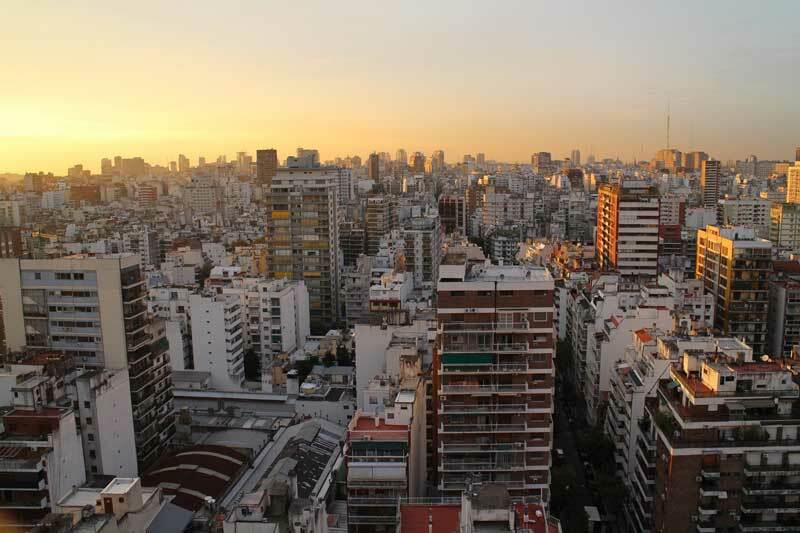 We'll take a look at rentals, long-term and short-term in both Buenos Aires and the rest of the country. The biggest city is always a different case and it's the entry point for most of the travellers and migrants to the country. 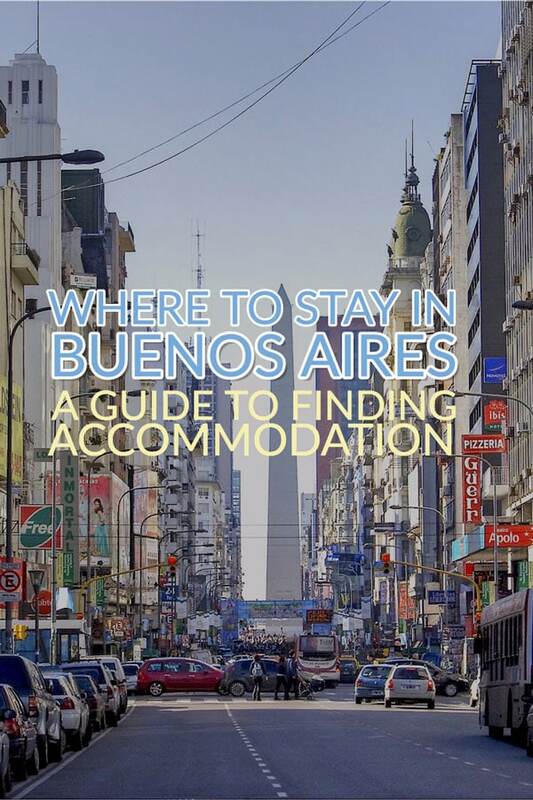 Let's take a look at the types of accommodation you can choose from in Buenos Aires. I lived in Buenos Aire for five years and I helped many visitors find places to stay. I've seen the insides of tons of hostels, hotels, apartments, and Airbnb properties. 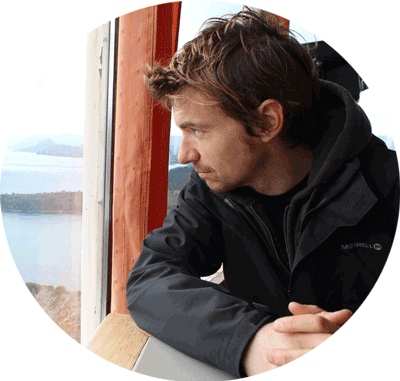 I can help you find the best places to stay in Buenos Aires for visitors and expats. Alvear Palace Hotel – Expensive but still great value for what you get. Fierro Hotel – Not too far from Vain Boutique and around the same price. Uber cool setting. Tango de Mayo Hotel – One for the dancers. Located on Avenida de Mayo, this is about as “Tango” as it gets. Milhouse Hostel Avenue – This amazing value hostel has been in the city for as long as I can remember. A classic backpacker location for exploring the city. Caravan BA | Hostel Boutique – A great value boutique hostel in Palermo with a pool. Dorms and private rooms available. If you're visiting Argentina and only have a couple of days, I recommend getting a hotel. Apartment living and Airbnb's self-catering aspects are great but if you have limited time you will probably want to get out an explore Buenos Aires and eat as much bife de chorizo and milanesa as possible. Hotels in the main tourist areas of Palermo, San Telmo and Recoleta neighbourhoods will often be better value and more convenient than an apartment if you're staying just a couple of days. However, apartments are the best way to live like a local, especially if you find a typical apartment in a traditional neighbourhood. More traditional neighbourhoods (barrios) include Almagro, Monserrat, Chacarita, Villa Crespo, and Barracas. More modern, and/or hip neighbourhoods include Palermo Hollywood (obviously), Palermo, and Puerto Madero. Puerto Madero's hotels are generally set up for business travellers. If your plan is to stay longer in the city (1-2 weeks) then you have a few more options. Stays of a month or more allow you more options on services such as Airbnb and Homeaway. Anytime I've been out of Buenos Aires for a while and return for a short period (several days to a week or two) I have used Hotels.com to find a good place to stay. This might not be the first site to cross budget-conscious people's minds as it appears to be an expensive option but I assure you it's not. Compared to Airbnb and some other short-term property rentals where prices have shot up in BA over the last couple of years, Hotels.com is often a real bargain. Get an account on the website (free) and when you search for a hotel sort by price (low to high). Also look out for ‘Your Secret Price' which are usually specials with quite big discounts. The image above shows the cheapest places to stay but includes every type of accommodation. 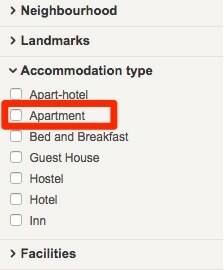 If you want to remove hostels from the results and focus on apartments then use the Accommodation Type selection in the sidebar. Another bonus with Hotels.com is that they don't charge cancellation fees. Note, however, that the hotel might do so. Best to check with the hotel before cancelling or read the confirmation email received when you booked. And lastly, book 10 nights anywhere and get 1 night free. There are around 100 hostels in Buenos Aires. That's quite a high number for a city that isn't top of the international list for tourists. Many of these hostels are dingy affairs and only suitable for people travelling on a very restricted budget. But hostels on a par with some high-quality hotels are also available. There are three main hostel booking platforms, Hostels, Hostelworld and Hostelbookers. All three are owned by the same company so if you're looking for real alternatives it might be worth your time checking outside of these portals. Agoda is my favourite booking engine for South America (and Asia). I've used it countless times to book great value hotels and guest houses all over the world. Homestay is designed for people that want a more immersive experience. Instead of renting an apartment and spending all your time chatting online with people back home, you get to live in the home of a local or local family. It's an ideal way to understand how Argentine's live, meet new people and practise your Spanish. 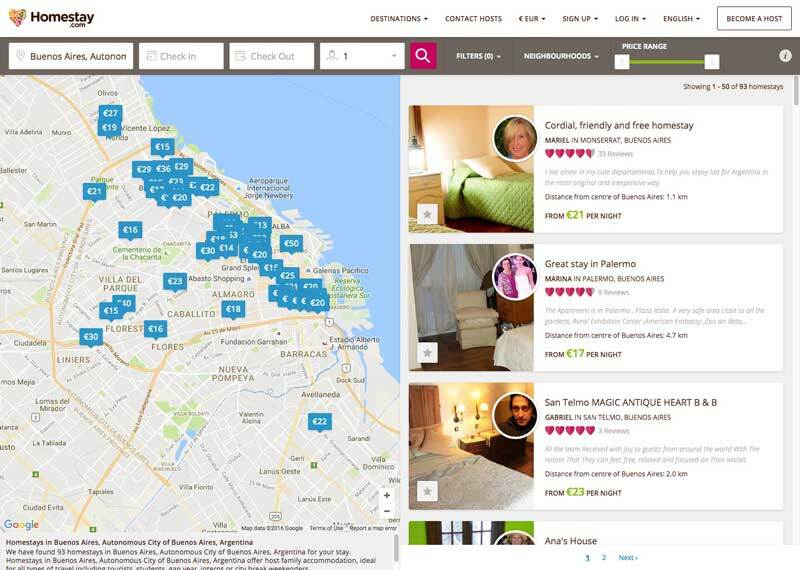 Flipkey, a Tripadvisor company, has an excellent interface for selecting apartments. There are around 1000 properties, including apartments, B&Bs, villas, and private rooms, available at any time in Buenos Aires alone. 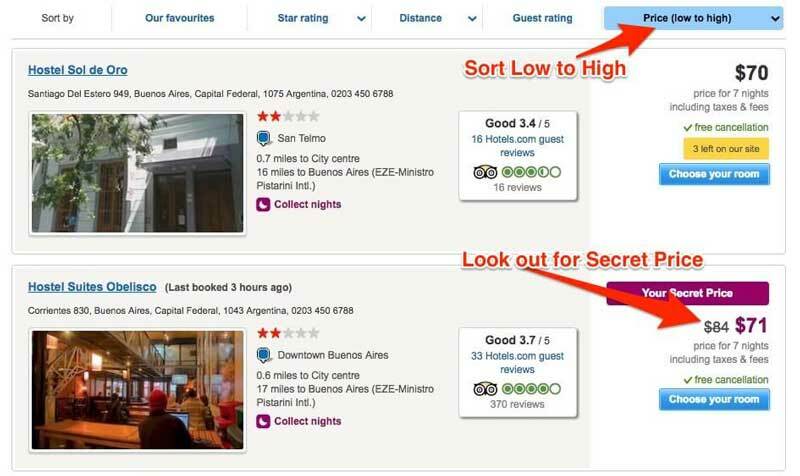 If you search outside of peak season, such as April, you can find some good deals (€20 / night and under) for week-long stays in neighbourhoods like Recoleta and Palermo. Flipkey also offers discounts (25% in some cases) if you sign up for the service. For longer term rentals in Buenos Aires, and in Argentina in general, you will need a bit more paperwork, and in most cases, a garantía. A garantía is property offered by a third party as collateral (or guarantee) to ensure that the renter does not damage the property. It's also to try and prevent people from taking over properties and not paying rent. This is quite common in this country and is a source of worry for landlords. Agencies take up to 3 months rental as a fee, which is an extortionate amount for the work they often have to do. But that's the accepted amount and there's only a handful of ways around it. Bypass the agency by using websites like Craigslist, Solodueños, or by using Mercadolibre or Trovitargentina and filtering for owners only. Before you sign for an apartment make sure you have read and understood all the details in the small print. Charges for electricity can be astronomical and water charges build up. As the price of everything fluctuates in Argentina but generally heads skywards fast, you need to know what you will be paying at the end of the month for any amenities. It's easy to get stuck with a cheap apartment that has very expensive charges for everything from water to gas. When I went to live in Argentina on a permanent (at the time) basis I found my first apartment on Craigslist. The owner of the apartment I eventually rented for over a year was a rich Russian internet finance guy who had several properties in Buenos Aires. He wasn't interested in dealing with agencies and said he based his decision on tenant purely on personal opinion. I didn't need any documentation apart from my passport. The apartment was also great value. Craigslist has a reputation as a scammy site and in many cases that's true. However, there are gems among the rocks and it's worth spending a few minutes a day scanning for these bargain apartment rentals. Warning: Craigslist is still a magnet for scammers and looneys so be very careful. If you plan on visiting apartments that you found on Craigslist bring a friend with you. Preferably a large burly local. 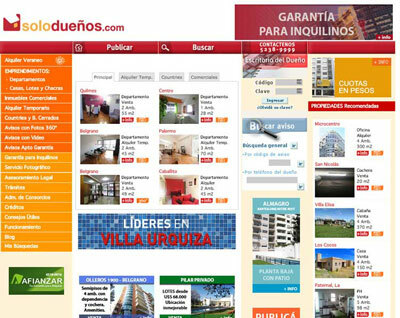 A great site that provides owner to renter direct services for finding apartments is Solodueños (Only Owners). Renters (and buyers) can choose from apartments, houses, lots, and a whole host of other types of accommodation. Solodueños also offers a type of garantía that allows a rental transaction without the traditional guarantee of a relative's property. The site is only available in Spanish and the landlords will inevitably prefer to deal with locals. But by using some charm you can easily get an interview with the owner. The rest depends on you proving to the apartment owner that you won't wreck his property and leave the country (a legitimate concern for many). Mercadolibre is huge. The website is one of the biggest tech successes to come out of Latin America and pretty much everyone in Argentina has bought or sold something here. 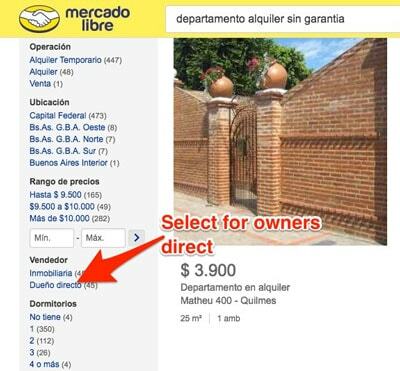 Naturally, renting or even selling houses on Mercadolibre is quite common. 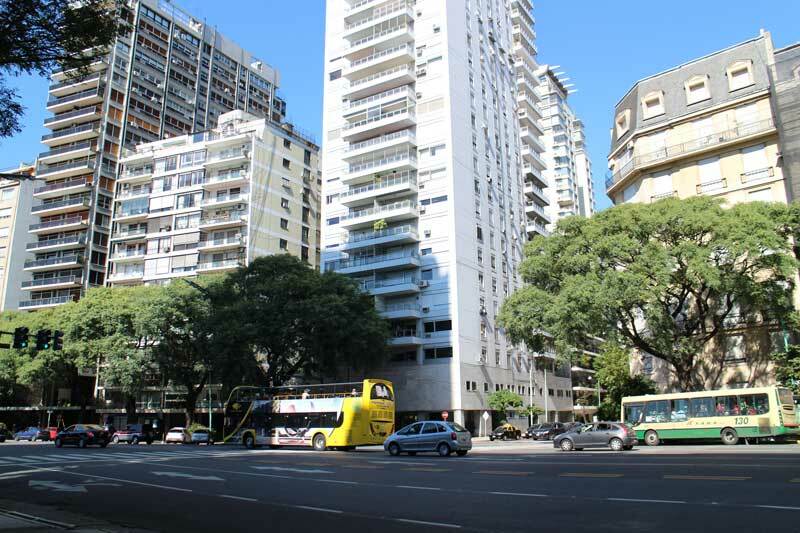 Around 1000 Buenos Aires (Capital Federal) apartments are up for sale at any one time. Around 2500 long-term apartments for rent are displayed on the site also. The majority of these apartments (called departamentos in Argentine Spanish) are placed by agencies but around 400 owner-direct apartments are available also. Select ‘Dueño Directo' from the sidebar to view these options. Several forums aimed at foreigners in Buenos Aires can be good sources to help you find an apartment. The fact that these forums are run mostly by expats is no guarantee of security or preferential treatment, however. Check each listing of interest in detail and ignore anything that has even the slightest hint of being scammy or suspicious. BaExpats.org often seems like the place where expats go to complain about everything and anything but this section of the forum can have some good leads. 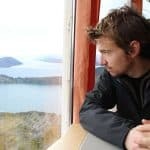 The Expat.com website's Argentina Accommodation section contains lots of sales pitches and non-accommodation related posts but sift through the listings and you might find something interesting. 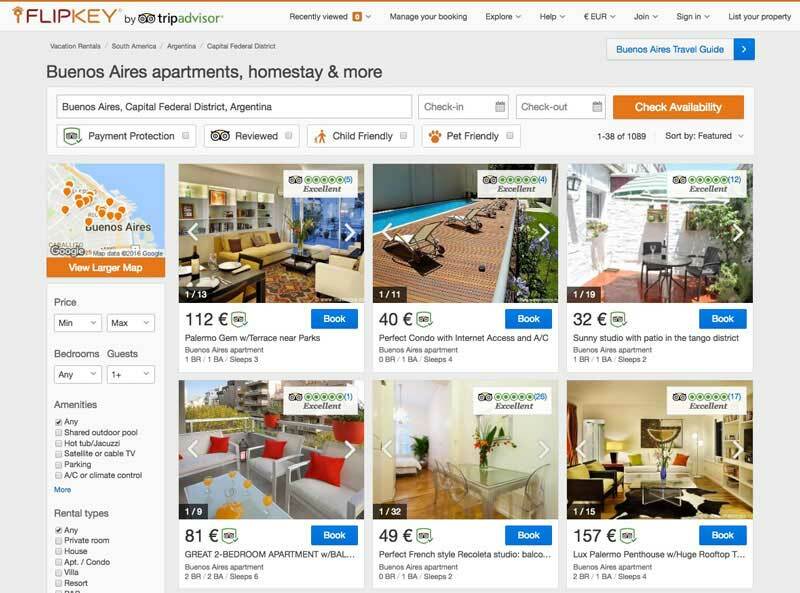 Agoda has a good range of places to rent in every city in Argentina. Agoda isn't as well known in the US or Europe as some other booking sites but in emerging economies, Asia, and South America it's a very popular hotel and flight aggregator. Homeaway is a good option for 1-2 week vacations in anything from apartments to entire estancias. From bargain basement to luxury there's a good range to choose from in every corner of the country. If the ‘guarantee' is your stumbling block, and you have funds, a good option is to offer to pay a year in advance and a large deposit. This at least shows that you are committed and that you have cash to support yourself. If they don't accept the year in advance for some reason the landlord might still offer the apartment to you as you've given him another reason to trust you. Sharing an apartment is another good option if you don't mind losing the odd bit of food from the refrigerator, and other people's toenails in the shower. 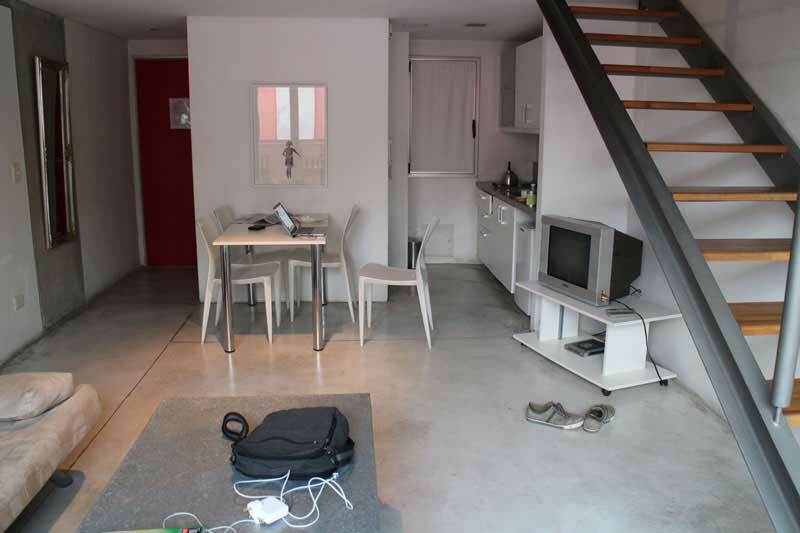 Sharing an apartment, and even a room, can be a great way to practise your Spanish. Even if you're sharing with other non-native Spanish speakers it's easy enough to set rules whereby everyone must speak Spanish only. Even if you don't implement any language schools sharing an apartment is a great way to meet people. Try EasyRoomMate/CompartoDepto.com and search for any large town in Argentina. Two slightly unusual options, but ones that could work for the right people are both based on house-sitting. The house sitter minds the owner's home and usually does some chores, and sometimes maintenance, while the owner is away. Housecarers.com doesn't have too many options but is worth a look as competition will be small. TrustedHouseSitters.com is aimed at animal lovers that are willing to care for the house owner's pets while staying in their home. 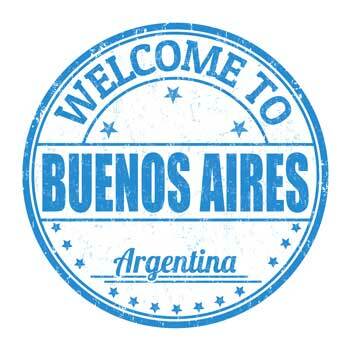 Most of the options in the Buenos Aires section can be applied to other towns in Argentina. The key is to be very patient. Like most Latin American countries the pace is slower and people don't like to be rushed. Showing that you have patience and are committed is the best advice. Having some Spanish helps a lot. Good luck with your search and if you need some more advice drop me a line on the contact page or leave a comment below! Hello, I am a single girl travelling for the first time in February to Buenos Aires speaking 40 percent Spanish and 4 other languages , travelling from Canada and staying just 7 days in Buenos Aires. Where is the safest places to stay and get a hotel or hostel not very expensive but not too cheap and also very close to good Tango places and city center and good restaurants and pastry shops. Try 70 30 Hostel in Palermo. It’s cheap but clean. Great location near Tango, food, and it’s a safe area. Palermo is the best area to stay for short visits.